GEOGRAPHIC LOCATION Tehri Garhwal is situated 250 kilometers north of New Delhi, in the western end of the mighty Himalayan mountains. 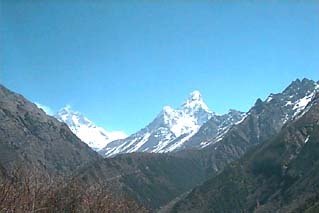 On the western side it borders the present state of Himachal Pradesh, on the northern side it borders Tibet, and on the eastern side it borders the area of Uttar Pradesh known as Kumaon. The total area as in 1947 was approximately 5,50,000KMsq. The census taken in 1941 showed the population at 3,97,369. The state of Garhwal has two of the most revered rivers of the Hindus, the Ganga and the Yamuna. Both of these rivers start in Garhwal. Garhwal has some of the highest peaks in the Himalayas including, NandaDevi 7818 meters, Chaukhamba 7412 Meters and the Bandarpoonch, 7168 meters. There are three big lakes in the region of Garhwal. They are the Hemkund at 4778 meters, the Roopkund at 4670 meters, and the Kakbhusandi at 4100 meters. "GARHWAL" - the land of many GAHRS meaning forts. This region was made up of many small forts which were ruled by chieftains. Therefore, the history of Garhwal before the dynastic rule of the Panwar rulers is very obscure. Kanak Pal was the first ruler of the state of Garhwal in 823 AD. He came from what is now called the state of Maharastra. The name PANWAR is made up of two words, PAN and MAR meaning, "He who crushes enemies". Kanak Pal came to Northern India in the early 9th century to help Nepal against the uprising of Tibet. He subsequently settled down in Garhwal and started the rule of the Pal dynasty from 823 AD to 1947AD, a reign of over 1000 years and 60 descendants. Ajay Pal, the 37th descendant, was able to unify a large part of Garhwal and do away with the reign of the chieftains. Ajay Pal established his rule after defeating the chieftains and set up his capital at Shrinagar, Garhwal. In time, the rulers of Garhwal increased their kingdom size and power. Infact, Garhwal was one of the independent kingdoms on which the mighty Mughals of Delhi had neither any influence or supremacy. The rulers of Garhwal remained independent and repeatedly expelled the attacks of the Mughal rulers of Delhi. During the rule of Shah Jahan, the Emperor of India in the 17th century, Rajamata Karanwati of Garhwal, the mother and regent of her minor son, Prithiviraj Shah, humiliated Emperor Jahangir by not only defeating his forces but also returning the survivors with their noses lopped off. Later when Raja Prithivi Pati Shah became the ruler of Garhwal, he gave shelter to the bothers of Emperor Aurangzeb in the end of the 17th century. The use of the suffix "Shah" after the name came to be used around this time instead of the "Pal". This was similar to the Mughul rulers use of the title "Shah" to denote their kingly status. The Garhwal rulers assumed the "Shah" title alongside their name indicating their position of being kings over and independent state. The only blemish in the history of Garhwal is the was with the Gurhkas during the reign of Pradyumna Shah. During the turn of the 19th century, the Gurkhas attacked Garhwal and drove the rulers of Garhwal down to the plains (Rishikesh, Haridwar, DehraDun). Pradyumna Shah died in fighting at the battle of Khurbura. Thereafter the rulers of Garhwal took the help of the British forces in India and regained their kingdom. The rulers of Garhwal gave away 60% of their kingdom for the support the British gave them in driving back the Gurhkas. During the Second World War, the Raja Narendra Shah gave the war effort his troops and air crafts to the British. In recognition for his services, the British gave him the title of "Maharaja", K.C.S.I. and knighted him Sir. Thus his full title was Sir Maharaja Narendra Shah K.C.S.I. The most abundant mineral in Garhwal was limestone. There was some gold mined in Garhwal but most of the revenue of the state was from forests products (wood, grazing) and land (farming). Garhwal has its own army and police force. However after the formation of India in 1947 and the subsequent merger of the various states in India at the time, the Garhwal Rifles was merged in with the Indian Army. Soldiers from this unit were among the first to receive the Victoria Cross - the highest decoration for a soldier in the British Army.services rendered by the British. The ruler at the time of the merger of the states into the Indian Union in 1947 was Maharaja Manabendra Shah.